What If Superman Didn't Kill Anyone After All? Warning: Spoilers ahead for Man of Steel, Trinity War and probably other things as they occur to us. There's been a great deal of discussion in the recent past regarding when and if it is ever appropriate for Superman to use deadly force. Mostly, fans seem to be of the mind that it's preferable that Superman never kill anybody. There are times when desperate times might call for desperate measures, but when it comes right down to it, actually executing those desperate measures (no pun intended) tends to be frowned upon by many fans regardless of the circumstance. It's a conversation that we've involved ourselves in a few times, most recently because the kickoff to DC's big Trinity War event seems predicated on the premise that he's killed Doctor Light. And of course that event was given more attention and turned out to be more controversial than it otherwise would be as a result of the events in the third act of Man of Steel, Zack Snyder's recent Superman reboot. Just an interesting theory I read on another board that I thought you might be interested in: In Trinity War, we know that The Outsider has placed a traitor in the Justice League. The theory is that the traitor... is Superman. Only Superman isn't Superman; he is Ultraman, who has willingly had his memories altered to make himself THINK he is Superman. Then, when the time is right, his real memories will be unlocked. This comes from the fact that Superman is still getting weaker. Ultraman gains his powers from Kryptonite, and being away from it would weaken him. 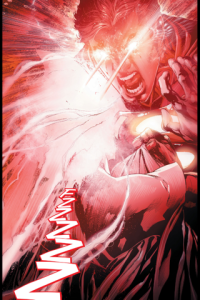 The fact that they made a big deal out of Firestorm needing to learn how to make Kryptonite could become a huge reveal that when Firestorm does just that, 'Superman' isn't de-powered but instantly healed. Add into all of this that Forever Evil will have the Crime Syndicate... and suddenly a lot of interesting things fall into place. Now, this is just a theory, of course. 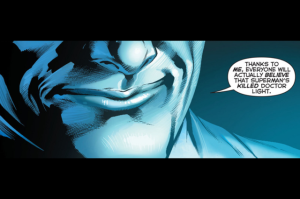 But it's one that makes sense, it jives with the image above wherein The Outsider says that he's led the world to believe Superman killed, and it would clear Superman's karmic balance if we found out that he was actually AWOL during the Trinity War story and not the one who did the deed.